I walked up.... and they’re crying I feel bad. anyone know why theyre crying? CASCADE is a hideout place on stage - a greenhouse for a dance that’s moving around ever so slowly without going anywhere in particular. Like a plant that’s using our perception for photosynthesis. Images are constantly growing and decaying in front of us but nothing ever really changes in this choreographic arboretum unless we want it to. If we look long enough things will get blurry or maybe the light is just fading out (again). In CASCADE choreography is turning into a camouflage, exploiting the vulnerability of our visual perception and uncovering something else. Friendly supported by Künstlerhaus Mousonturm, Hessischen Theaterakademie and Studienstiftung des Deutschen Volkes. „Der Körper ist Objekt für Experimente, nicht eindeutig definierbare Dinge verschwimmen in sich stetig verändernden Räumen. „The body is an object for experiments, things that can not be clearly defined blur in ever-changing spaces. This is fascinating in this "Cascade" choreography at times. The ever-changing fur and fur mass shows up in ever new forms, light and noise are confusing, since they rarely fit the stage happenings - a performance as a counter model to the usual overstimulation." Tom Engels: Let’s talk about some things that came to my mind while watching CASCADE (2017). As a start you maybe could trace back the genealogy of the making of this piece? I remember you telling me ‘camouflage’ was an important issue. Could you sketch the impetus for wanting to work with that notion? Emmilou Rößling: Before it got clear to me I was working on camouflage, I was busy with the forest and the fascination with the desire to hide in a forest. The forest is an entity in which you can find yourself, only able to see parts of it, but not being able to grasp it as a whole. Just like a landscape really; being part of it, you can’t perceive it with distance. You can only be part of it and see nature surrounding you. What would it mean then to hide in plain sight? Being there, but not being seen. Already as a child I asked my parents “Why is everyone looking at me? Make them stop!”. At the same time I was very much a child that wanted to be in the middle of what was happening. This paradox, wanting to hide and wanting to be seen at the same time, led me to making this solo - a solo in which I’m not seen. I’m the only one on stage, but also the one who is not there, and not expressing herself. Then quickly the idea of camouflage became more clear, and it started to appear quite literally in the sense that the piece contains explicitly mimetic elements. What you see is going for the mimesis of nature, yet the costume being 100% polyester. Choreographically speaking, I wanted to work on what I call a ‘choreographic arboretum’, or a choreography that could be looked at as a collection of trees, without it being a clear representation of those. TE: Let’s talk more about camouflage. In your piece it seems to be of a paradoxical nature. The ‘being’ on stage has elements of the typical camouflage as we know it: its own elements blend with each other and its colours are those of nature. We know camouflage also as a military notion: the goal is to blend with the milieu, so one stays hidden for the enemy. In CASCADE, however, it is clear that your body doesn’t belong in that environment. Because of the theatre set-up you propose, there is an impossibility of blending with its background. ER: What you say about the milieu or background is very important. I would say there are different ways to talk about camouflage, but the way in which you do, it needs indeed a figure and a background. These two become one: the figure blends with the background and becomes space. 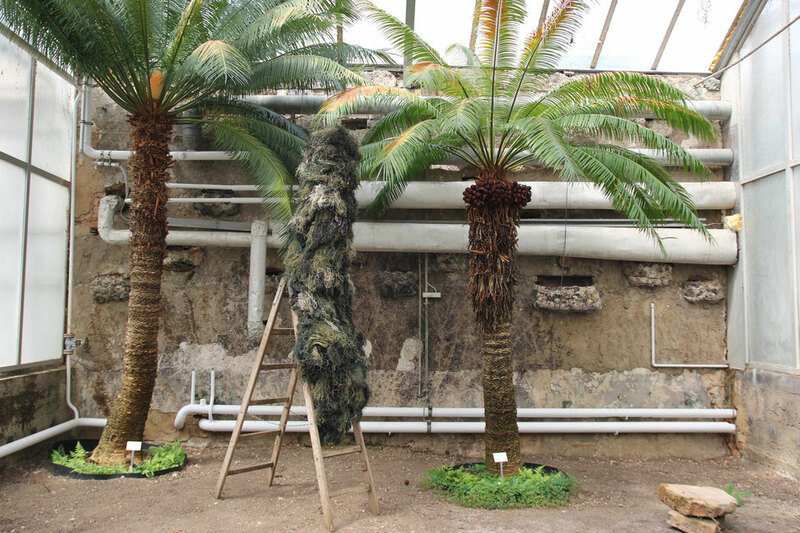 The costume made by Filomena Krause is completely exposed and doesn't find the background it needs in order to camouflage itself. There is just a short moment in the piece in which a screen consisting out of the same material as the costume appears. But still, I would like to make a difference between camouflaging and hiding. It leads me to stress a distinction between the three different bodies that are present in CASCADE. The first one would be my ‘real’, physical body, which is hiding in the costume and operating it from the inside, following a clear choreographically set trajectory. Through these different movement operations, this body takes different shapes and forms, which could be perceived by the audience as nature, trees, moss, plants, etc., and this is what I would consider the second body to be. Then there is a third one, which lies in the imaginary. It is the projection of what the real physical body is doing inside of the costume. You could look at the figure moving, and project a leg or an arm going up, but that projection doesn’t necessarily match up with what I’m really doing inside of the costume. The imaginary and the real body hardly ever line up in CASCADE. TE: To me it revealed an urge to mentally visualise that ‘real’ body. I don’t think it was a mere act of projection, but it rather spoke about the expectation of an audience member and him/her trying to define what he/she sees. We seem to want to know what we see, we want to locate it, categorise it, clearly trace its motions and understand its behaviour. Like in an arboretum, really, but then one of movement, and yet you confuse, delay or postpone such understanding. TE: … and which are not perceivable, or only when you would dedicate plenty of time and a technical, steady eye to it. ER: Yes, it has a completely different temporality. TE: And I think it is that slowed down temporality that the show tunes into. One has to adjust to another kind of movement vocabulary and one can only do so by tuning into the slowness and the different timing of that being on stage. To me they are inextricably bound. When one is not willing to give time, one will not perceive the vocabulary. ER: Exactly. To stick with the analogy of plant life, I like to think of the piece as using the audience’s perception for photosynthesis. Still, the time of a plant is completely different from the one of a performance evening. In that sense CASCADE is still an extreme acceleration. The performance leans on the idea of being plant, but it doesn't entirely represent it, nor in its form, nor in its timing. In CASCADE both body and environment go through their own patterns and cycles. That creates a sort of landscape with something I call ‘persisting images’ - forms that one has to undergo for them to be able to become something else. Perception then becomes the material the audience has to work through themselves. TE: Here we can trace different elements that seem to be connected. On the one hand landscape and on the other stillness, slowness, deceleration. As a first element I had to think about the landscape plays of Gertrude Stein, in which no single element is more important than the other. Every element has an equal value. It’s an idea that has been resurfacing in choreography in the past couple of years, in many different manifestations. They also came with notions of stillness and deceleration. These choreographic practices emerged as a negative mirror image of the seemingly accelerated time we live in. Were you dealing with that as well? ER: I certainly was busy with Stein’s landscape dramaturgy, in the sense that I was working rather through experience than observation, or emotions rather than story or clear narration. Yet, I don’t know if stillness and deceleration come from a need to oppose a life lived at high pace. There’s a widespread discourse around that observation. Still, I don’t think a slow experience in the theatre should become a therapeutical antidote to the life happening outside of its walls. I don’t think about it in any way like that. The show might be slow, but the audience might be very busy in their minds, at a pace which completely outreaches the pace of the piece. I think there is still a certain tempo in the perception that is not only slow and soothing. This connection between landscape and stillness has something that relates again to camouflage, and blending in. Moving so slow, you become space yourself. TE: You mentioned to me before that there might be a museum version made of CASCADE. 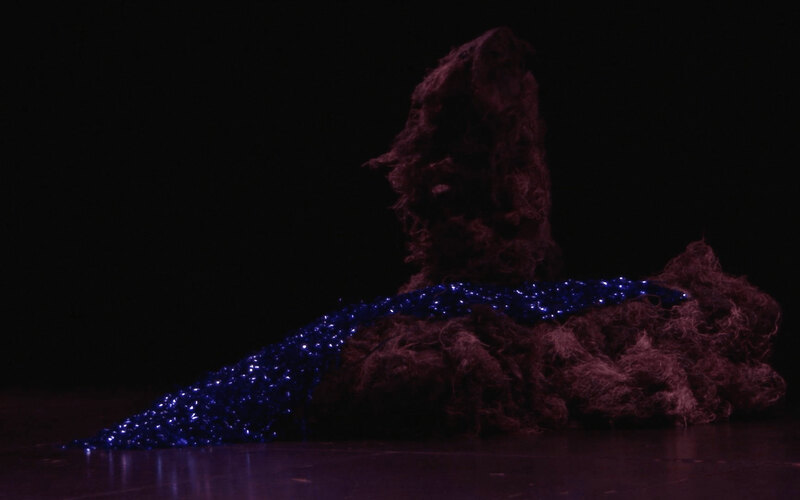 When I first saw the work, I thought that it could easily function in other environments as a different proximity than the one of theatre would reinforce the tactility and perception of the choreography and the costume. Then again, I was positively surprised that it clearly was conceived as a piece for the theatre. 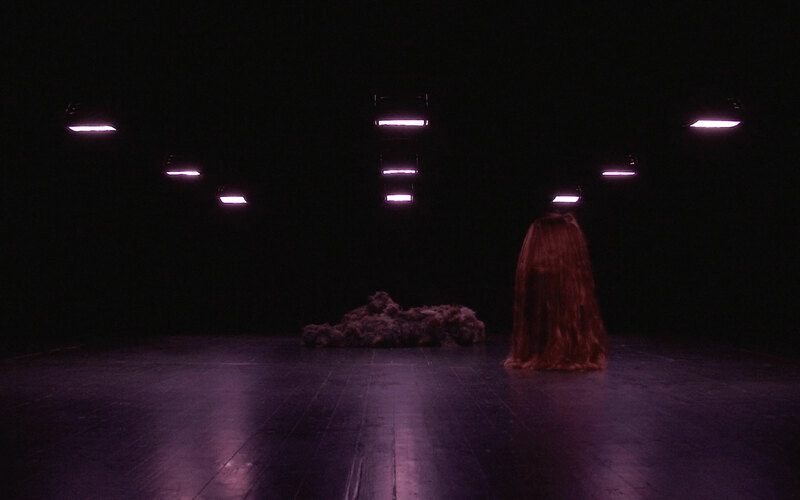 It felt as an affirmation of that environment in a time in which choreographers tend to think their work more easily in relation to visual arts context. 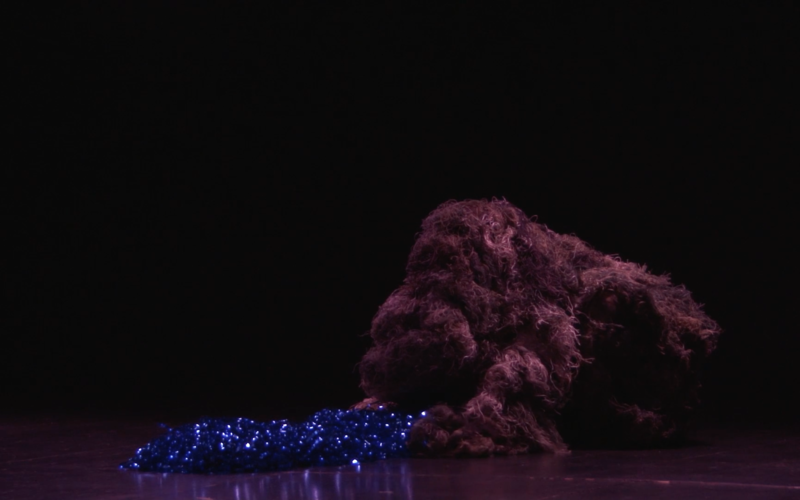 ER: The black box allowed me darkness, which is something the piece heavily relies on. Sometimes the light fades to levels where you can’t hardly make out anything anymore. There is definitely something in the black box that plays with darkness and brightness that is necessary. Although the movement is quite precisely set, the light runs as a preprogrammed track which can’t be influenced during the show. When I worked in the studio without these light conditions, I worked towards material that could work equally well in darkness or brightness. It shifts between the obscurity of darkness and clinical brightness. In these ‘contemporary’ questions around the white cube and the black box, I always wondered if we actually do need darkness in order to trigger imagination. Is it necessarily so that we have to take away vision in order for the mind to fill in these gaps? To me that sounds like a subtractive model of imagination. I’m hoping that we also imagine when there is a museum situation when everything is fully lit. When everything is open and visible, what else is there to act with? If you look at a tea cup, and you look for a long time at it, your vision will get altered just by the mere persistence of looking at it. If you repeat a word 50 times, a word will start to sound so strange, that the original meaning of it starts to escape. There will also be something that is not seen, or not revealed through an image or through language. Here imagination becomes really generative for me. TE: One could think the piece as a form of puppet theatre. You are the operator of the marionette, or an illusionary machine; you are operating the costume, but we’re not looking at you and your self-expression. You invest your precision, but not your ‘self’, as the image that surfaces is not directly connected to a form of self-expression. ER: I think that’s very true. A lot of times I’m busy thinking “Now I have to move there. Now I have to extend the part of the costume into that direction. Now I have to open this.” This is very much the internal function of being ‘planned’ as I said before. I’m in that sense beyond self-expression. Yet, the difficulty of performing the piece is that I’m still using some somatic techniques to stay in the mode of being plant. I use different breathing techniques to stay hyperaware of where my skin touches the costume, so that I can breath into that extension. Maybe there are more somatic fictions but it really helps to not only create the illusion of the image and to really invest in the feeling of this creature moving around. TE: There I see a very strong separation between what is inside and outside. You seem to have no way of visualising the image you produce from the inside. Therefor you need to stick very closely to what has been planned before. It’s remarkable to give that out of your hands as a performer and choreographer. As you can’t see it yourself, I guess you’d have to rely on others. Especially in the set-up of the solo, which is such a prime celebration of the individual. How were you working with that limitation in the creation process? How do you choreograph yourself when your exterior image doesn’t match the interior one? Maybe it never does? ER: The minimal vision I have heavily complicates visualising the image I produce. In the studio I would just film myself and work on certain tableaux vivants. I produced certain constellations, which in the end I called my choreographic arboretum. I had about eight poses and through very simple choreographic principles, like mirroring, retro-grade and repetition, I would create a chain of movements. With this technique of video and still images you end up with imagery that has a clear front, which is simply due to the lens of the camera. When you would watch the piece from the other side, you would rather have a backstage feeling. Later on in the rehearsals my collaborators, Filomena Krause, Niels Wehr and Johannes Von Bebber and Marie Meyer, guided me in recomposing and adjusting the figures. Of course it is daunting to give something out of hands, and to give up a certain degree of control. But in a sense this piece was not this classical solo prime celebration of the individual, as you said. It wasn’t a piece about self-expression and being in total control of the image produced, so I was more willing to let go. Then again the people were not the only ones having agency in the decisions made, but the costume and its material did as well. Filomena and I had to make different prototypes out of hunting gear to slowly move to the final version of the costume. As the costume had to change because of the movement, the movement also had to adapt again to the costume. TE: Could you maybe expand further on how this removal of oneself brings together questions of identity, performativity and camouflage? Do these terms negate one another, or is there a possibility for their co-existence? ER: In camouflage studies as they have been advanced by Roy Behrens there is a rule of thumb that as long as an attribute can be defined and identified, one can counteract that attribute and the opportunity exists for camouflage. In CASCADE what performs is camouflaged into not performing, leading to the question of how the performativity of camouflage can be situated. One possible answer could be that since camouflage is withdrawing from identity it is also withdrawing from performativity. But I believe this to be a weak conclusion as there is no reality without performativity and thus nothing to navigate with. So what I propose is that camouflage is indeed not showing something (as in something identified) but instead some thing, meaning it carries performativity but we cannot determine what exactly. It is outside of language. Camouflage is moving from a mere effect to an affect, leading the audience to arrive at an interpretation via the production of their own experience of the piece. I hope that even though there’s a lot of things hiding out and not seen in CASCADE that the camouflage in fact opens up the potential of some thing else to happen or appear. Tom Engels works as an editor, curator, writer and dramaturge. 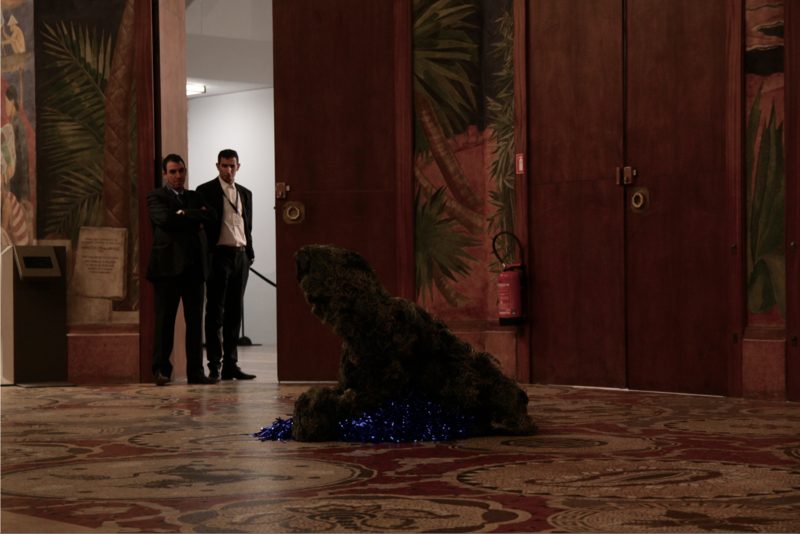 He is the director of Sarma, the Brussels-based laboratory for discursive practices and expanded publication. As a dramaturge, he recently worked with Alexandra Bachzetsis, Mette Ingvartsen and Florian Fischer. His writings appeared in visual arts and performing arts magazines such as De Witte Raaf, Extra Extra Nouveau Magazine Erotique, Etcetera, a.o. His last curatorial project another name, spoken was presented at Jan Mot Gallery (Brussels) in 2017. Engels is also active in different educational contexts like P.A.R.T.S. (Brussels), S.N.D.O. (Amsterdam), Centre Nationale de la Danse (Paris) and is a Guest Professor at the School of Arts in Ghent. He holds degrees in art history (Ghent University) and Choreography and Performance (Institut für Angewandte Theaterwissenschaft, Giessen).